You need to be able to solder and, as a minimum, you will need a soldering iron, solder and wire cutters. This simple circuit pulses an LED to maximum brightness approximately once every 0.5 second. Runs off only 3 volts so you can use two 1.5v cells of any type. A pair of "AA" cells will run this flasher for 6 to 12 months continuously. Put it in your car to discourage theft and make it easier to find in a dark car park. Hang it from the bathroom light switch pull-cord so you can find it in the dark. Fit it inside a model aircraft, train or car. Build it on a tiny piece of "Veroboard", stripboard or make a printed circuit board like this one. Double the value of the capacitor to make it flash only once per second (battery cells last even longer). 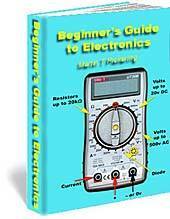 Beginners Guide to Electronics includes full instructions and photographs for building the above LED Flasher Kit project. Simple to make, this torch comprises a High Brightness LED, a transistor, resistor and a tiny coil which you wind yourself. PCB and key fob supplied. The result is an intense beam of light produced from a 1.5 volt mercury cell or a 1.5 volt cell of any type. Battery cell gives at least TWELVE HOURS of continuous use! Lasts for years. Great fun to build, this micro-miniature torch is simple but very useful. Carry it with you to use in an emergency. Handy for finding the keyhole, lighting your way in the dark or looking inside equipment. Instructions, PCB, all parts and battery included with kit. Why not use several to add interest to your Christmas Tree, plant pot or window display? A tiny printed circuit board that flashes two lamps alternately to simulate a coal fire or oil-burning lamp. Runs off 12 volt dc supply. Flicker/amber and red for coal fire or oil lamp or model train coal furnace or barbecue. Slow flash/two red lamps for railway crossing or Police Car rear lights. Slow flash/two white lights for Police Car/Ambulance headlamps. Slow flash single or two blue lights for any Emergency vehicle or single green for Doctor's car. Ultra slow (approx every 8 seconds) white bulbs for railway signal box to simulate movement inside.